They have worked together for years in close proximity, but as distinct teams following different procedures. They now form one entity — the Buildings Infrastructure and Power Supplies (BIPS) Project Team, in charge of delivering the buildings of the ITER installation. 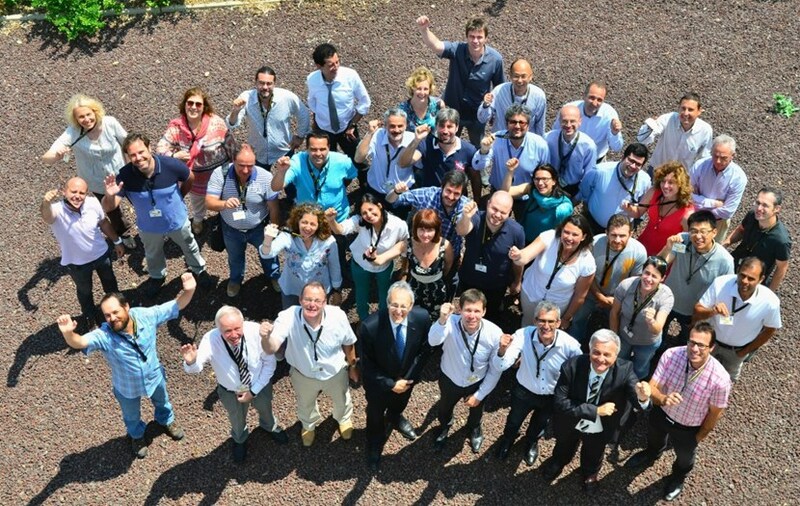 Composed of 38 staff members from the European Domestic Agency (Fusion for Energy) and 27 from the ITER Organization Central Team, the BIPS Project Team celebrated its creation on Friday 5 June. ITER Director-General Bernard Bigot stands in the front row, at centre. Composed of 38 staff members from the European Domestic Agency (Fusion for Energy) and 27 from the ITER Organization Central Team, the BIPS Project Team celebrated its creation on Friday 5 June. Project Teams are not just about gathering the skills needed for the execution of one area of the project—they aim to create a context of synergy so that the result is more than the sum of the parts. All the players, within their areas of competence, are integrated into a cohesive decision-making body that is invested with the authority to take all the necessary technical decisions. "I have great expectations," said ITER Director-General Bernard Bigot as he addressed the assembled members of the BIPS team. "Without buildings, there can be no ITER; but your responsibility extends well beyond construction. Like all of us, whatever your position or job description, you must feel responsible for the whole project." The creation of Project Teams, 20- to 60-people strong, stems from the necessity to render the management of critical technical issues more efficient. Within the teams there should be improved communication, reduced paperwork, and swift decision-making, as well as an end to the duplication of certain procedures. The BIPS Project Team is headed by Laurent Schmieder (Fusion for Energy) with deputies Romaric Darbour (Fusion for Energy), Simon Sweeney (ITER Central Team) and Laurent Patisson (ITER Central Team). Please also see a report on the new Project Team from the perspective of the European Domestic Agency here.